We understand the need to have a good hair dryer all too well. After all, who wants to be left with flat looking hair once it has dried naturally? When you go travelling, many places don’t supply a hair dryer when you are staying, or they leave you with one that doesn’t do much at all. Having your own travel sized model can be a real lifesaver, and it will ensure you look amazing when you are off on a night out. Of course, you have the difficult task of trying to find the right hair dryer for you, but you aren’t alone. We are here to help you, and also to offer some advice, so that you can find the best travel hair dryer. We have put this guide together, compiling all of the relevant travel hair dryer reviews in one place, so you can find the right one for you and your hair. BaByliss is one of the biggest brands when it comes to products and tools for turning your hair into the best it can be. 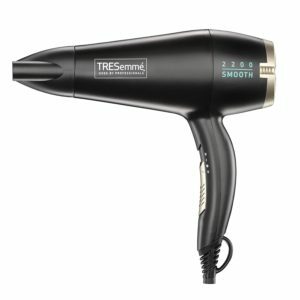 If you want a travel hair dryer that is going to stand the test of time and deliver great results, then this the place to look. Have a peek at the reviews and see for yourself. This hair dryer comes in a great shade of pink with black detailing, giving your haircare essentials a little bit of glamour. The handle is incredibly comfortable to hold, preventing sore hands, and the machine itself is lightweight so as not to put any unnecessary pressure on your arms. It also has a very compact design that makes it easy to store away and take travelling. One of the key features is the fact that it has dual voltage for your convenience, making it perfect for use in any country you want to visit. It comes with a diffuser to help prevent frizz, as well as two heat and speed settings so that you can have the ultimate level of control over the way your hair is styled. The powerful motor also ensures some seriously fast results. Some customers felt that it could have benefited from a little more power. 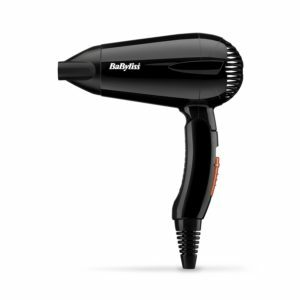 This hair dryer comes at a very low price that is sure to fit in nicely with any budget, making it ideal for any traveller. While there are some customers who felt it could have been a little more powerful, they also noted that the provided power levels are excellent for the price. 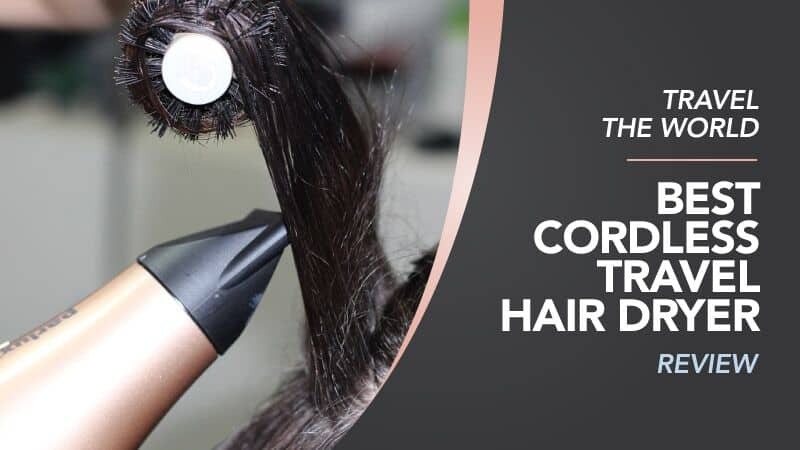 Plus, it comes with a great attachment and additional features that are sure to leave your hair looking amazing. From a trusted brand at an excellent price, it’s one to keep your eye on. Remington is another big brand, and if you are searching for something reliable and trustworthy, you may not need to go further. For a travel hairdryer that works beautifully in Europe, there are some reviews below that you can have a read through to see if this is a perfect match. This hair dryer has a sleek and modern design that will have you falling in love instantly. Plus, it comes in a glossy black and has a comfortable handle, providing you with a good grip that won’t leave your hands cramping, and a lightweight built that will go easy on your arms. Plus, it is pretty compact and easy to store away, which makes it an ideal travel companion. The motor is powerful, ensuring that your hair is dried as quickly and efficiently as possible for its size, and with results that leave your hair looking shiny and healthy until your next wash. It even has an eco-setting to keep your energy bills and environmental impact down. The ceramic grill is there to prevent static and frizz, and you also have several heat and speed settings to choose from. Some customers found that the cable was very short, and so they had to stick close to the sockets. 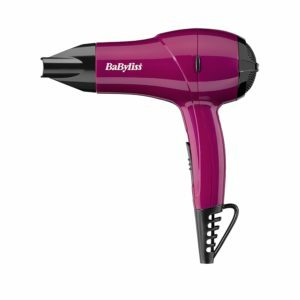 This hair dryer comes at a seriously cheap price, and one that you might not want to miss out on. With low costs, anyone can afford it, making it suited to every traveller who is off to see the sights in Europe. While some customers found that the cable was a little short, it is possible to borrow extension leads – although hotel bathrooms tend to have the sockets very close to the mirror. Compact and lightweight, with a load of great features, it is one of the best models out there. Made by professionals for those who want salon quality at all times, TRESemme is a brand that knows how to deliver excellence. If you want something lightweight and durable, this is the place to go. Take the time to read through the reviews below and decide if this is the one for you. This hair dryer is sold in a brilliant shade of black with some very cool silver detailing that gives it a spark of individuality. The handle has an interesting shape that makes it ergonomic and easy to hold, ensuring that sore hands and arms a thing of the past – with added thanks to the incredibly lightweight build of the model as well. The rear filter is removable, and it also comes with a concentrator nozzle for more control over your hairstyles. In addition to this, there are also two heat and speed settings to choose from, as well as a cold setting. With a decent length cord, this hair dryer also uses ionic technology, which works to ensure that your hair is free from frizz and static when you have finished drying it. Some customers found that it overheated at times. 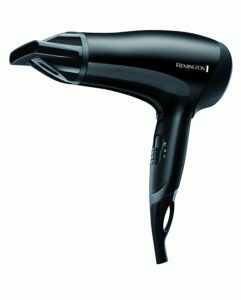 This hair dryer has a very low price point, which makes it great for those who are on a budget or don’t want to spend a lot on a hair dryer that they are using for travelling. While some customers found that it overheated sometimes, these reviews are few and far between when compared to those who found it to be an excellent and efficient model with easy control over the temperature settings. From a trusted brand and at a very reasonable price, it is one to look into further if you need something lightweight and reliable. Here are some further models of travel hair dryer, just in case the ones above do not quite meet your requirements. Another model from leading brand BaByliss, this hair dryer has been made to make travelling that much easier for you. 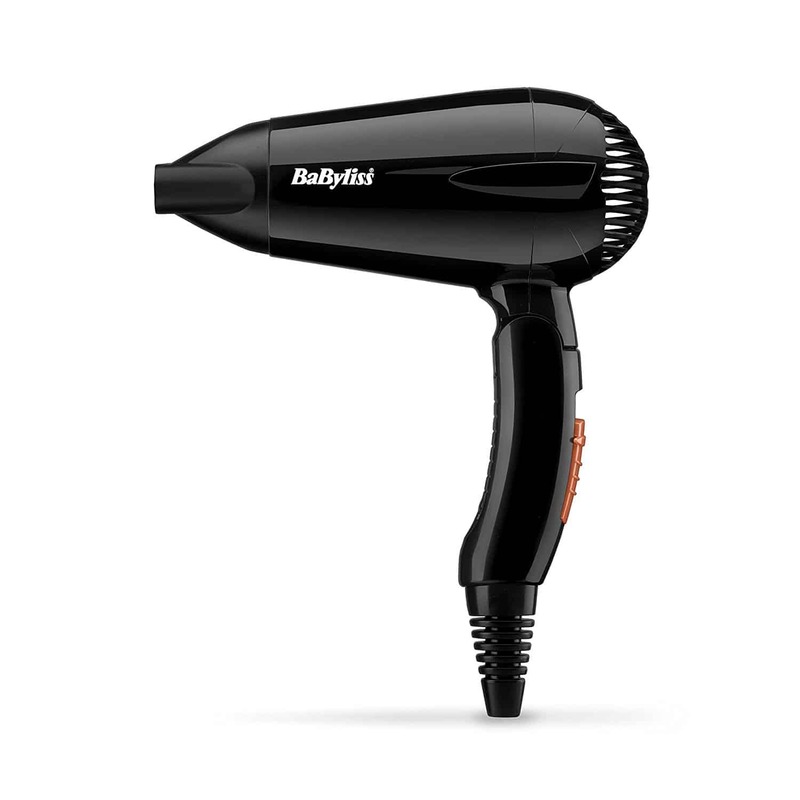 Powered by batteries, you will be amazed at just how quickly and effectively this hair dryer can dry your hair. You’ll never need to worry about cables and voltages again with this fantastic piece of kit. It is also incredibly compact, with a folding handle to reduce its size for travel, ensuring that it packs away into your case with ease. This hair dryer is also very lightweight, reducing pressure on your hand and arm while you dry your hair. Available at a very low price, it’s one to consider. 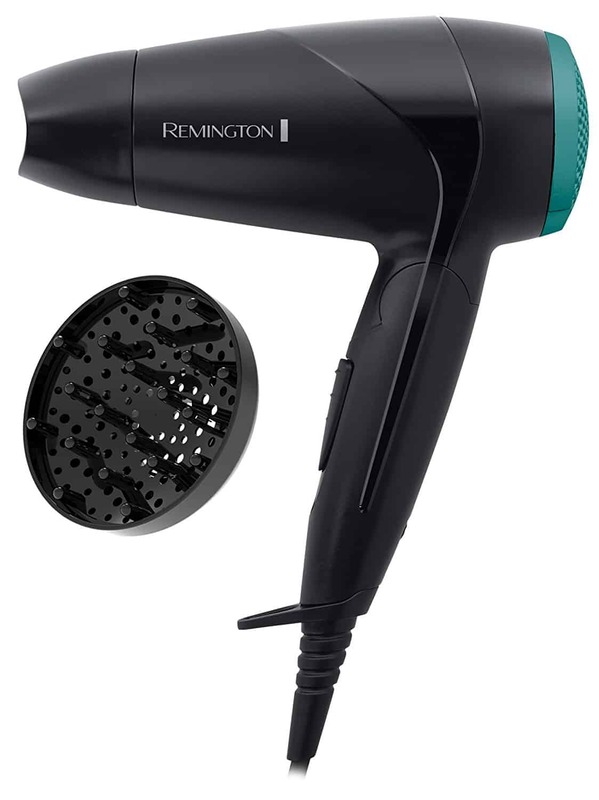 Looking again at Remington, this sleek hair dryer comes in a traditional black with turquoise details. If you are travelling abroad, you don’t need to worry about the voltage as this particular model is suitable for use across the world – making it a dual voltage hair dryer. The handle folds to make it easier to store away, ensuring that you have a little extra room in your bag and making it more compact. Lightweight, it won’t leave you with sore hands and arms when you dry your hair. Additionally, it has two speed settings and heat functions so that you can achieve the style you want. All of this comes at a great price too. Hopefully, this guide has helped you to find the best travel hair dryer, and the travel hair dryer reviews gave you some extra information. Hair dryers are so important to have, especially if you want great looking hair, but you can’t always rely on one being provided when you travel. We have listed some brilliant models form a number of different brands, so you can find one that you know and trust. Plus, they come at a range of prices, ensuring that you are able to choose a travel hair dryer that first perfectly into your budget. We have also reviewed the Best Quiet Hair Dryers when you need to quiet when get ready in the mornings. We are positive that one of these is going to be just perfect for you. What did you think of our travel hair dryer guide? Are there any that you would have liked to see or recommended? We love hearing from you, so make sure to leave us a message in the comments below.